Le réveillon de Noël | One quality, the finest. In a country known for the magnificence of its cuisine, two meals surpass all others: le réveillon de Noël (luh ray-vay-ohn duh noell) (Christmas Eve dinner) and le réveillon de Saint-Sylvestre (New Year’s Eve dinner). Families used to attend Midnight mass and then have a big feast to “réveiller” or wake up again due to the late hour of the festivities. If you want to do Christmas Eve in style, the sumptuous menu at the Plaza Athanée on Avenue Montaigne is a festive option with many of the dishes featuring truffles this year. 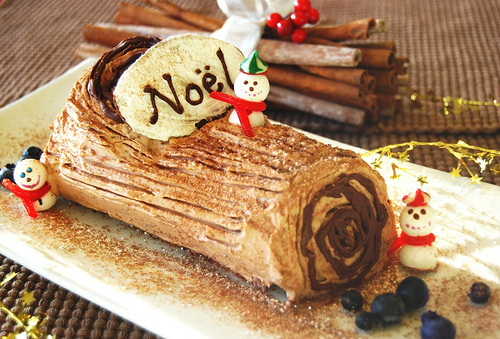 The classic family dinner typically involves goose, turkey, or duck, a fish dish, numerous side dishes, and concludes with a buche de Noël, a sponge cake rolled and decorated to look like a Yule log. Many family splurge on foie gras (goose or duck liver pâté) and oysters. This is not the time to worry about calories or arteries. Joyeux Noël! This entry was posted in Cuisine and tagged buche de Noël, foie gras, French Christmas traditions, le réveillon de Noël, le réveillon de Saint-Sylvestre, Plaza Athanée. Bookmark the permalink. My mother made one every year for years when we were growing up. We celebrated Christmas eve and my brother’s birthday, although the candles sometimes melted the whipped cream! Pingback: Saint Silvestre | One quality, the finest. Pingback: Les treize desserts | One quality, the finest.